Following my obsession with Sally Hansen Effects Real Nail Polish which is kind of like the DIY alternative to Minx (but in my experience, stays on even better and is a lot more affordable), the peel-and-apply nail strips just came out with their exclusive prints for the holidays and they are just as festive as they are pretty. I nabbed their “Plaid About You” red and black print for myself and adore it! It took me ten minutes to apply it before heading out to meet my friends for brunch (this is when no-dry time comes in handy!). My friends loved the design, which also happened to match the red lipstick I was rocking that morning — Nars Pure Matte Lipstick in Vesuvio! Thought it was a good way to ring in December and the holiday season…and it unexpectedly re-invigorated the 15-year-old-Nirvana-listening-flannel-obsessed-Shyema. Someone cue Smells like Teen Spirit! What do you think? The new prints also include Peppermint Twist (red and white candy stripe), Snow Bunny (white with red snowflakes), Prep’s Cool (black and silver argyle), and Winter Funderland (black, silver and blue glitter) and costs $10 for a kit of 16 polish strips, a cuticle stick, and mini file-buffer. Tip: Use the pointy side of the cuticle stick to evenly shape the ends near your cuticle!! You’ll be a pro in no time. You can pick one up at any drugstore/mass retailers! I’ve been dying to try the holiday collection!! 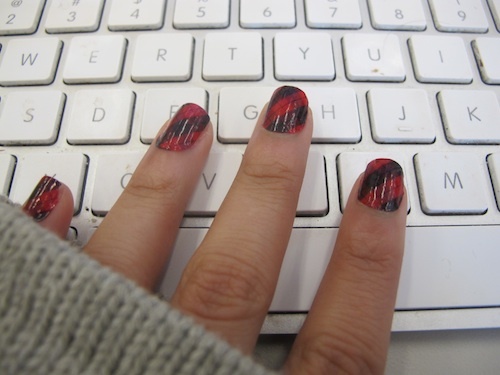 My favorite Nail Effects are still the Laced Up! I kind of want to try them in every design…they’re so pretty! I adore! looks so good on you! They may seem pricey at first glcane, but you can get a lot of wear from a single box. I only open one half of the included strips and use them for both hands, still having extras. They last a long time for me; anywhere from a week to 2 weeks (and then some). I usually get tired of them and remove them to change my nails before they’re ready to come off. 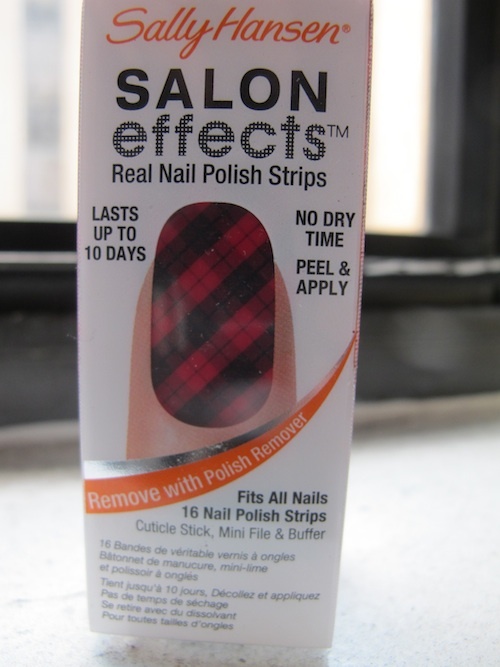 Compared to others on the market, the Sally Hansen Salon Effects are my favorite! :)Wait for the Buy One Get One 50% off Sale, which Walgreens will run from time to time (as well as other drugstores). There are usually $1 off coupons you can find too. I know there was one on Coupons.com last month, but I don’t think it’s there anymore.